Maybe it's over in the generic sense of the word but we still have troops in the area and in Kuwait. We still have troops actively serving in a combat zone in Afghanistan. We still have the war going on in the homes of the veterans across the country. Hearing the news took me back to May 2003, when President Bush declared an end to the "major conflict" in Iraq. Really? We had been over there less than two months and the hard part was over? Then why did we continue to lose loved ones during deployments? If the major conflict had truly been over, they would have come home. My son and his comrades would be who they use to be. Two other events from May 2003 stand out for me. The day the media announced the first death in my sons unit. I was terrified. I had family come and stay with me for several hours. Then we finally heard that yes, there was a life tragically lost but the soldier was in another unit entirely. That was my first experience with understanding survivors' guilt. We were ecstatic that it wasn't my son, but I knew that a woman somewhere was getting the very real news that's I feared. We did lose many during the time, but I will never forget that date of May 8,2003 when we were erroneously informed that it was my son's unit's first death. The other event that stands out from that month is the phone call from my son about escorting a young girl to school for the first time in her life. He has a younger sister and he was seeing for the first time how some females do not had the right that American women do. He was a protective big brother and from some conversations with some of his comrades, I know he took that "big brother" instinct with him to the Middle East. Maybe the war is is over in the eyes of our political leaders, but it is not over in the families of those that have served in combat. Some never made it home. Some lost limbs. Some received concussions from constant explosions. Some live with physical and emotional wounds that will forever exist. I have mixed emotions about the news last week. All I want is our troops to make it home safely. Some of them won't. Some have made the ultimate sacrifice and some have lost a part of themselves over there. We live with the results of combat everyday when we welcome them home. I still consider myself one of the luckiest moms because my son came home, even though it changed him so. This isn't his fault. The physical compression on the left side of his skull that can be seen with an EEG isn't his fault. The epilepsy, mood swings, headaches and memory loss he now has as a result of TBI and PTSD are not his fault. Ther war in Iraq is over. Now, it's time to gear up and be prepared. 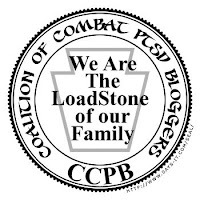 We need to be their battle buddies here at home as they deal with medical and mental issues that being a combat vet can bring to light. And, we need to be here for each other so that we know that we are one big family and no one feels alone while battling TBI and PTSD.